To answer the question, "What is Aromatherapy?" we have to first look at the history of this ancient practice to understand it better. You will also read how to use the essential oils, the benefits of aromatherapy, how it works and also some precautions. Using the essential oils for healing dates back many centuries, and is really an offshoot of herbal medicine. And we all know how long herbal medicine has been around - every since man walked this earth. But it was in fact the Arabs who first discovered how to distil the precious oils from the plants a thousand years ago. Since their discovery and the beneficial use of these plant oils, aromatherapy has spread over the years first to India, China, then to Europe and finally to the rest of the world. However, aromatherapy was propelled forward into the modern world by Dr. Guttefossé who, in 1910, while working in the family perfume laboratory, burned his arm very badly. Aware of lavender oil's healing properties, he immersed the burned arm into a basin of the lavender oil and was astonished at how quickly the pain subsided and the burn healed. He then dedicated his life to discovering more about the essential oils of plants and their healing qualities. It was he who coined the phrase "aromatherapy" to promote health and well being using these essential oils. Essential oils are highly concentrated oils that have been distilled from various plants. Sometimes it can take many flowers or leaves to make a small amount of oil, which can explain the price of some of these essential oils. Pure oil of Rose for example may smell beautiful and heady but then that is because 5000 roses were processed to give a mere 1 teaspoon of oil. As a result we should use these oils sparingly, because they are very precious indeed. 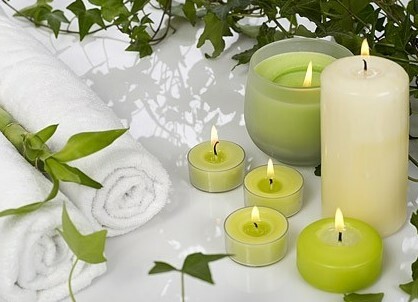 Used correctly, aromatherapy will bring relief to a number of illnesses and they are wonderful when used in massages. However, if they are used in too concentrated form, they can cause irritation of the skin. There are some 200 commercially produced essential oils, all obtained from the leaves, flowers, bark, seeds, or wood of aromatic plants. The most common method of extraction is to use steam distillation. In this process steam is passed over the plant tissues, the volatile compounds evaporate and are then condensed in water. Citrus oils are expressed from the rinds of the fruit. Some flower petals are treated by the slow process of enfleurage. This is when blossoms are placed on a layer of cold fat, which absorbs the oils. Fresh blossoms are added until the fat is completely oil saturated. The resulting substance is then called a pomade. It is then washed with alcohol to remove the oil. In France, where enfleurage is used to extract such essences such as tuberose and jasmine, the process involves as many as 36 different additions of fresh flower petals. Most essential oils are produced in small quantities, which makes them expensive, but only very small quantities, measured in drops, are used in each treatment. Massage aromatherapy: This therapy involves therapeutic massage using essential oils diluted in a carrier oil. Sometimes acupressure and other massage techniques are incorporated. This is the most common form of aromatherapy used in complementary medicine. Cosmetic aromatherapy: Here, essential oils are combined into various beauty products, such as skin or hair products, and used for beauty therapy treatments or home use. This is also practised by beauticians and beauty therapists. Olfactory aromatherapy: Essential oils are released into the atmosphere via vaporizers, burners, or sprays for inhalation. This type of aromatherapy is mainly for home use but is also used in some schools, hospitals, and work places. Medical aromatherapy: This therapy is sometimes called aromatology. It involves essential oils being taken internally. This is only practised by medically trained aromatherapists, mainly in France. Culinary aromatherapy: This uses essential oils in cooking, for example in the form of infused oils drizzled over vegetables or used to flavor rice or herb butters. A trained aromatherapist will introduce you to the the healing properties of essential oils - perhaps through a facial or body massage or, if you have a specific problem, through whatever form of treatment is effective. The range of ailments covered is enormous - from pregnancy, nappy rash, bed-wetting, teenage acne, period pains and menopause to jump-starting your libido and controlling an over-active one. Armed with the necessary oils you can "do-it-yourself" at home with a few drops added to the bath, vaporized over a burner, inhaled under a towel, fragrant bowls of pot pourri in bedrooms and living rooms, compresses applied to certain areas etc. So you have all these essential oils derived from plants, but how exactly do they work? Well, the clue to how aromatherapy works can be found in the word itself. The therapy is derived from the aroma, or smells from the various oils. These can either be put in candles, in water, or in a carrier oil. Our mood and how we feel is largely affected by smell. Using certain oils used in a massage can induce calmness and feelings of relaxation. They will have a similar effect if added to bath water. Your skin is your largest organ. And what we put on our skin gets readily absorbed and eventually finds its way into the blood stream. With aromatherapy the oils are absorbed into the skin and rapidly penetrate organs via the nervous system and sometimes the endocrine system. They are capable of healing and stimulating the internal metabolism and muscles. However, the oils do not stay in the system long, being expelled by the lungs, the skin and through urine. Because essential oils work through smell two or more oils can be blended, but one should never blend more than 4 oils together. Less is more, in this case, and usually a blend of 2 oils is more than enough. Never over-use your oils. After a while, if you use them every day they lose their effectiveness as the brain gets used to them, and doesn't react to them as it would if they were presented sparingly. Never use the same essential oils for more than 10 days at a time. Not all oils are equal. There are some that are stronger than others. Although all oils should be used sparingly, there are some oils where you would only use 4 drops to do the job, and others as many as 10 drops. You need to get to know your oils to understand what their potency is, how they react to the skin, and how to use them safely so that there is no feeling of irritation. Always dilute your oils. Always use a carrier oil with your essential oils. This is usually an odorless, cheaper oil, such as Sweet Almond oil that is used to spread the precious, more expensive oil onto the body. A common dilution ratio is 1 %. This means no more than 20 drops of essential oil per 1/2 cup of carrier oil. Never use citrus oils just before going into the sun. These oils are photosensitive meaning that when you go into the sun they react with the sun on the skin and can cause skin damage. Never take essential oils internally unless you know what you are doing. Many are highly toxic, some even causing death. Only use them externally. One of the benefits of using aromatherapy oils is that they work very well in water. So placing them in your bath water is an ideal way to use them. On average you would only need about 5 drops in your bath water, that is how potent they are. However, as I said, it really depends on the specific plant being used. Lavender oil, for example, is very mild and you could add 10 drops to your bath water, whereas peppermint is quite strong and you wouldn't put in more than 4 drops. Whatever oils you use, just remember that the benefits are subtle and not immediately apparent. As mentioned before you cannot put essential oils directly on the skin neat as they are far too strong and can end up damaging the skin. Instead, they are mixed with a carrier oil. Usually 20 drops per 1 oz of carrier oil. Combine all of the oils with a carrier oil in a dilution of 5 %. Combine all the oils with a carrier oil in a dilution of 3 %. Combine all the oils with a carrier oil in a dilution of 2 %. So know what you know what aromatherapy is hopefully you will feel confident to use these wonderful essential oils and get some benefits from doing so. Later, in another article, we will discuss each of the main essential oils and tell you how they can be used in more detail.